Since it is his bounden duty to defend the vested interests of the former military regime whose opaque deals continue to enrich the generals under the smoke screen of the military conglomerate Union of Myanmar Economic Holdings (UMEH) and the subsidiary of a state-owned Chinese arms manufacturer Wan Bao Company, he is not all moved by the tragic incident of the Letpadoung Mines. It is definitely a touchy issue in Burma, as several senior leaders including Than Shwe, his former deputy Vice Senior-Gen Maung Aye and many other powerful generals have allegedly siphoned state money and benefited from military-run projects, many of which are tied to China’s powerful businessmen, companies and government leaders. The crackdown complicated the investment picture of China, which has struggled with the tarnish internationally accepted image of exploiting the peoples of foreign countries at any cost, so much so that the Global Times, a state-owned Chinese newspaper, published an article accusing the West and advocacy groups of instigating the protests against the mine project, and said that shutting it down would be “a lose-lose situation” for the two countries. Anti-Chinese sentiment was a major factor in the cancellation of the Myit Sone dam and now the people of Burma are targeting this mine. Many activists will no doubt begin to raise the issue of the gas pipeline project and other hydropower projects in Burma. China is one of the main investors in all of these projects. To be candid the story originates in 1981 an American launched a mining venture, a cyanide heap-leach gold project in the state of Colorado. To save expenses, instead of taking necessary precautions, it leached 35 million pounds of cyanide and other toxic tailings into a nearby watershed. When it became known, the Colorado State government stop the operation in 1991 and the US Government launched a $150 million lawsuit against him. He declared his company bankrupts and fled the country to Canada where he already had connections and is now a respectable gentleman of Vancouver. Soon he got his chance with Golden Star Resource at Omai on the Essequibo river in Guyana. Using the same strategy, he leached 3 billion liters of cyanide-laced mine tailings into the river, not only poisoning all life including fish stocks but also ruining Guyana’s farmlands. Knowing this disastrous act would soon be uproar, his company fled after garnering a huge profit. Although labeled as the worst environmental disaster in Latin America, he escaped legal action by cunning. Then in Labrador (Canada), his company, Diamond Field Resources, struck a huge base nickel deposit in the native territory of Innu and Inuit (the outside world known them as Eskimos) where he become the biggest shareholder in the world’s largest deposit of nickel. Soon he turned his attention to Asia and the Pacific and targeted the authoritarian regimes in Indonesia (under Suharto), Vietnam, China and Burma. This time his financial vehicles were Indochina Goldfields and Ivanhoe Capital Corp (ICC). He was helped by an expatriate Burmese businessman, Reggie T. Maung, now is a Senior Vice President of Ivanhoe Myanmar Holdings second only to him. 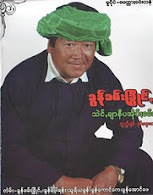 T Maung connected him with Tay Za, a tycoon who became rich through his connections to the military government via Than Shwe the evil genius and the Junta’s supremo. During the Junta administration widespread forced labor was routinely used in building of infrastructure in areas around the mines. Open pit, heap leach mining is prone at the best of times to be a dirty business, especially when regulations are weak. Open-pit mining involves clearing standing vegetation and forests, diverting drainage systems, disrupting drainage patterns and destabilizing topography, causing mountains to collapse. That is the sole reason of why the people of Burma together with the monks are protesting and demonstrating. The heap leach design creates serious problems since waste rock and toxins have to be contained for a long period of time to avoid leaching. There is a serious risk of acid rock drainage, where exposed waste rock will leach sulfur trioxide when it rains. This is especially dangerous when heavy rainstorms and occasional flooding occur during the monsoon period. Mine tailings can contaminate local drinking water supplies, and poison water bodies and aquamarine life. Ivanhoe Mines knew this and by cunning he sold all these Mon Ywa Mines to the Chinese Company Wen Bao. This is the gist of the story of copper mine project, in Letpadaung mountain range in Salingyi Township, Sagaing Division jointly established by China and Burma, which has become the target of growing protests. The Burmese people are sure that to maximize the profits China will use the same old method. Independent investigation is next to impossible and local enterprises and foreign companies that do not answer publicly to shareholders and do not follow international accepted standards run these mines. Wen Bao was executing a day to day operation while UMEH just take its share of the profit. In past years an increasing number of people have expressed their faith in the "codes of conduct" but there are growing skepticism about whether such codes are relevant or enforceable in Burma. The authorities did not respond to better environmental, human rights and labour standards, but to the need for foreign investment, which led them to meet, the structural adjustment criteria set by multilateral institutions. Where infrastructure and power supply are poor there is bound to be slave labour, as the ruling authority would prefer to protect its own internal interest rather than the welfare of local communities. That is exactly what is happening in Letpadoung mines. Last month to be exact on Nov.18th, a group of people protested in front of the Wen Bao Company on the Western Trunk Road bringing the mine operation to a halt and the next day when President Obama spoke at the Rangoon University a group of students protested letting the cat out of the bag. The protest soon spread to Rangoon, Monywa, Mandalay, Pakokku cities prompting the quasi military to charge the six activists including the former political prisoner Naw Ohn Hla and the detention of the well known monk U Gambira and the Home ministry ordered the ending of strikes. But the protests spread like a wild fire as hundreds and thousands of people joined this ecological disaster affecting all the people of the vicinity and the surrounding area and so Thein Sein administration used excessive force to quell the peaceful demonstrators injuring some 70 Buddhist monks some of which got third degree burns. The crackdown is a setback for Burmese democracy movement especially that focus on the crucial question of land rights, an issue that is likely to become more contentious as economic growth makes villagers’ land more attractive to companies and property developers. After seeing the violent crackdown on peaceful protesters the people of Burma are quite convinced that they have finally seen the true colors of President Thein Sein and his “reformist” government. Thoroughly mocked on social media, with his top peace award bestowed by the Brussels-based International Crisis Group is particularly ripe for ridicule. How can a double monk killer be awarded a peace award? More than 7,800 acres of land from 26 villages under the shadow of the Letpadaung mountain range have been seized to make way for the Chinese-backed project since it began last year. This is but one of the many hush hush controversial project of the former junta which Thein Sein will defend with tooth and nail. Several prominent activists have also visited the area to pledge support, including members of the 88 Generation Students group and Daw Aung San Suu Kyi. The influence of Beijing in Burma cannot be discounted even though Burma opens its doors to Western investors, with the US relaxing sanctions and normalizing relations with the former pariah state, Beijing becomes more nervous. Aung Min, a minister attached to the Burmese President’s Office had openly admitted that “We are afraid of China.”  This explicitly means that the Thein Sein administration had already made up their minds to stop the protest at any cost. Beijing has long been staunch supporter of Burma’s brutal military regime and served as a lifeline by providing arms and shielding the former junta from international censure, particularly by blocking resolutions of the United Nations Security Council. 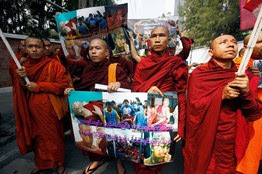 Even though the Chinese and Burmese authorities have a good relationship, public sentiment could grow as people see images of Buddhist monks being brutally beaten and burnt, and could easily become a nationwide issue. Fierce anti-China sentiment has been on the rise with protesters demanding a complete shutdown of the copper mine citing illegal land confiscations, deforestation and toxic waste seeping onto farmland so much so that China sent Xu Zenhuan, the Foreign Affairs Committee of the Chinese People’s Political Consultative Conference. The 8888 Generation called for the commission to review and analyze the Letpadaung copper mine project, to postpone all work until the probe’s findings are published and to stop arresting activists as well as release those already detained. The incident of Letpadoung Mines demonstrated the true colour of the new administration which the international community has been heaping with praises. In other words the international community has seen Burma as “The emperor has new clothes,” but the people of Burma saw it that the emperor has “no clothes at all”. The irony is that the violence occurred just a few hours before Daw Aung San Suu Kyi arrived on a scheduled visit to this area which explicitly demonstrated that the Thein Sein administration have no respect for her and her party at all. The crackdown showed once again that the government, which claims to have turned over a new leaf and to listen to public opinion, is only really protecting the Generals’ interests and those of foreign investors. That is the raison d'être why the riot police suddenly charged into the camps and viciously assaulted unarmed protesters. This action alone clearly proves that Burma’s ongoing political opening is still reversible. But the greatest lesson is for Daw Aung San Suu Kyi and her supporters, she has joined the government with the vain hope that it will be more reasonable to join them and to work from inside just as I did when I worked at the Prime Minister’s Office as the Foreign Affairs Secretary. But I regretted as I soon saw the true colour. Daw Aung San Suu Kyi has not said anything on Kachin Crisis or Rhakine sectarian strife and now this Letpadoung incident is another classic example. But still the people of Burma has hope on her, how long would she stay quiet is still to be seen. The people of Burma in their epic struggle knows that neighbouring countries are out and out to exploit the country’s natural and human resources for their own benefit and now that Burma is starting to change their companies are still clinging to the old concept of working with the men in uniforms and the Letpadoung incident demonstrated that the government is not on the people’s side. No doubt the clashes underline one of the dilemmas facing the government, whose steps to promote greater freedoms have led to public protests and strike action at factories. The protesters oppose the environmental and social damage they say is being caused by the mining operation and most people remain suspicious of the military, while China is widely seen as having propped up army rule for years, in addition to being an aggressive investor exploiting the country's many natural resources. Government officials had publicly stated that the protest risked scaring off foreign investment that is key to rebuilding the economy after decades of neglect. But the real reason is that the old generals have pocketed handsomely some say in billions of dollars and if the deal fell off with China, then they will have to give back what they have taken unlawfully and hence is pressuring The Thein Sein administration to stand tough. In such a clear situation, the people of Burma sees that only the West particularly the US and EU stands by them in time of crisis. Both President Obama and Daw Aung San Suu Kyi knows that real democracy and federalism is still to be achieve and should take much more tougher stand on the side of the people of Burma rather than with the ‘longyi wute’ (လံုခ်ည္၀တ္ ) Burmese sarong wearing ex generals. U T Maung also skillfully used religion to shore up the business when he made himself Chairperson of the Vancouver Buddhist Society, to which Ivan Hoe mines graciously donated $75,000.The Burmese activists in Vancouver were furious when the Surrey Sayadaw sided with the Junta and they founded a new Burmese Monastery in Richmond. Please drop me line if you are free. Pefect! Saya Bathan Win. Drop me a line if you are free. How's Sayama, please say Hello to her.